1940. Adventure. Directed by Michael Powell. Stars Sabu, Conrad Veidt, John Justin, and June Duprez. 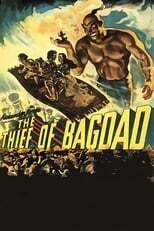 After being cast out of Bagdad, King Ahmad joins with a thief named Abu to reclaim his throne.